The Powerspread Pro range consists of two models the 2400 gallon machine and the 3200 gallon model. The Pro 3200 has a capacity of about 15 tonnes in solid manure– the concept behind its development being to boost capacity and increase discharge rate to bring it in line with the output expected from similarly sized rear discharge spreaders. The main drive from the pto has a shear bolt protection and two further shear bolts provide over load protection for the rotor and auger drive – both of which employ simple chain and sprocket drive systems. The paddles are attached to the rotor by a single bolt and, as a result, when an obstacle is encountered, rotate backwards to prevent damage. Should the system experience a blockage, access to the machine is made easy by raising the exit door slide to its full extent and, for the first time, by being able to hydraulically lower the rotor to below floor level so the maximum accessible area becomes available. A reverse drive facility is also fitted as standard enabling the operator to reverse the central feed auger in the event of a blockage. 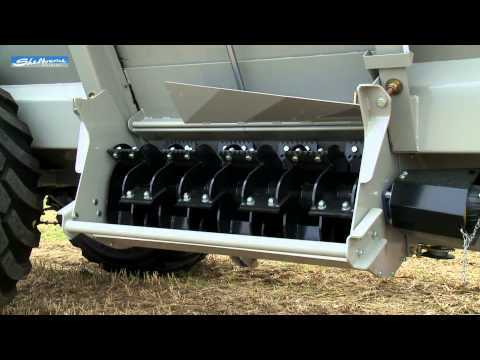 An adjustable slurry deflector allows the operator to control the spread distance and height. Both the Pro 3200 and 2400 models require very little power to operate – the brunt of the power being required to handle the weight of the fully loaded spreaders. As such, Shelbourne Reynolds recommends a minimum of 120hp for the larger spreader. Running gear comprises 650/65 R 30.5 Trelleborg flotation tyres on a single axle with an option for tandem axles. Options extend to air brakes rather than hydraulic brakes and, for those needing to know precise application rates, weigh cells can be fitted if specified.